What makes an eyeshadow awesome? INTENSE PIGMENTATION – so that you don’t have to keep going over and over the product with a brush or your finger to get some decent payoff. The L’Oreal HIP Eyeshadow Duos are named so because in every High Intensity Pigments eyeshadow duo, there is one extremely pigmented color. Really, just one. More about that in a while. The L’Oreal HIP range of eyeshadows and eyeliners came to Singapore in 2010 for a very short while and I really didn’t think much of them. It was only much later, and after reading how people absolutely worshipped the HIP range that I was brought to attention how good they really are. But by then, L’Oreal had pulled the entire range out of our shores. Booohoooo…….!!! The metallic teal color on the left is said to be a dupe for MAC Parrot and that got really me excited! Well, that’s because I don’t own MAC Parrot and any dupe is welcomed! I really bought Showy for the teal color and it doesn’t disappoint in the payoff department. It goes on smoothly and gives a bright pop of color to any eye makeup look. The blue on the right, however, is just flat and boring. It is low in pigmentation and takes quite a bit of effort to get just some color out of it. Using NYX Jumbo Pencil in Black Bean or Milk might help in bringing out the color more, but if Jumbo Pencils crease on you like they do on me, then for that amount of time spent trying to dig color out of it, we’re much better off not using the blue at all. The right matte blue is also chalky, similar to the Kat Von D Beethoven Palette eyeshadows. Showy is one great eyeshadow duo, if only because of the color on the left. I find myself not reaching out for it too often though because the blue can create a pretty dramatic look even for a nightout. And the bulky plastic is not the easiest thing to carry around. If you like loud and discoball glitter all over your lids, Platinum is the one for you. It is almost like aluminum foil with lotsa glitter, totally living up to its range of Metallics. Just like Showy, the color on the left is the star of the show while the right is the letdown. I like my glitters and shimmers, but the silver is way too loud and flashy for me. Not recommended for someone who prefers neutral colors or who is not adventurous with glittery eyeshadow finishes. While it takes a light sweep of the brush to pick up a ton of color from the silver, the black is almost unresponsive. For a good matte black eyeshadow color, go for MAC Carbon or its substitute NYX Black. I wonder why the product packaging was approved. Who designed it anyway!? Gosh, it is one big bulky chunk of plastic with the top side housing the duo eyeshadows and the under side an unnecessary big space for one sponge applicator that is utterly useless. 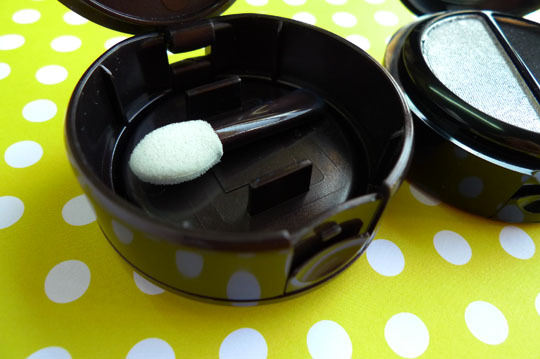 When you open the side of the eyeshadows, the bottom lid opens too as the lids are just right next to each other. Sheesh, what were they thinking?? I read some reviewers complain about the mirror on the under side. I don’t know why mine don’t come with the mirror but I can imagine that it would be annoying to have to close the top side and open the under side every time I need the mirror. That is, if I even bother to use the mirror at all. I ordered L’Oreal HIP Eyeshadow Duos in Showy and Platinum; L’Oreal HIP Color Chrome Eyeliners in Violet Volt and Silver Lightning from Ulta during its BOGO (Buy One Get One) sale. Had to wait a month for them to arrive from US though! Despite the great pigmentation of the eyeshadow colors on the left half of the palettes, I personally feel that the size of each pigment is larger than those of other brands, like MAC and Urban Decay. Like they’re less finely milled and you can see the chunkiness glaring at you. I think I might wanna depot the eyeshadows soon. The bulky packaging is keeping me away from them. I might like them more if they were in my customizable makeup palette – The Z-Palette! I created this makeup look with all four colors from these 2 eyeshadow duo palettes, along with L’Oreal HIP Color Chrome Eyeliners in Violet Volt and Silver Lightning. The blue liquid eyeliner is MAC Liquidlast Liner in Inky. Have you tried any products from the L’Oreal HiP Range?